About a month ago, while visiting Riverside Cemetery in Asheville, North Carolina, I come across the grave of Daniel Ogden pictured here. 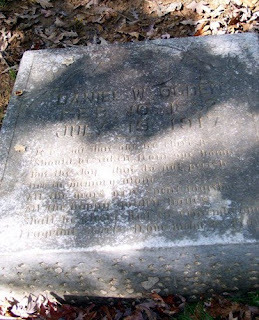 I was actually on my way to see a more "prominent" memorial in the cemetery when I noticed Daniel's gravestone was fallen over and lying on the ground. I snapped a few photos, simply because I always get the urge to document stones that look to be in trouble. When I got home, I found a sweet epitaph for Daniel etched in the stone. I also snagged a little more information about him with a bit of research. Fragrant sweets from memories' flowers. I found Daniel in the North Carolina Death Certificates, 1909-1975 collection at Ancestry. It states Daniel was born in Liddieville, Louisiana to Daniel W. Ogden of Woodville, Mississippi and Epsie Brown of Winnsboro, Louisiana. Daniel was married at the time of his death, and his occupation was Meat Cutter. His address was 403 West Haywood Street in Asheville, though his usual residence was listed as Mississippi. Daniel's cause of death was pulmonary tuberculosis. It seems Daniel was one of the many with this disease who came to the Asheville area hoping the clean mountain air would improve their health. Sadly, for him, it did not. He passed away at the young age of 35.